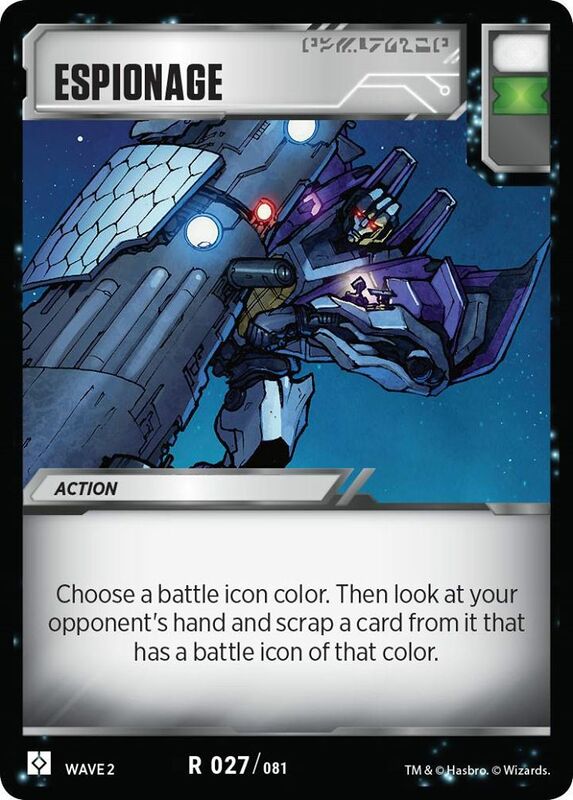 The official Transformers Trading Card Facebook has uploaded a note by Ken Nagle, Design Lead for Transformers TCG, with a complete description, effects, and how to use the Espionage battle card effectively in the game. The Espionage card, featuring a great Cybertronian Skywarp art, was tested in Wave 1, but now it has been improved to another level in Wave 2 after introducing the green battle icon (After a battle, you can swap a card in your hand with one of your flipped green cards). Check out all the interview here or you can click on the bar to read and comment on the 2005 Boards! Espionage can disrupt more than just Enigmas. If my opponent is playing Megatron, I can use it to get rid of Fusion Cannon. Playing against Insecticons? Say bye to the bugs favorite cards. Another idea would be from Thundercracker's movie story when the pair went to star in their High Octane Buddy Action Movie that flopped. They should make a "Delinquent Duo" featuring Frenzy and Rumble. On the card itself – I like how much it reminds me of Forceful Sentry and Confiscation from the early days of YGO. The fact that this card does not feature Soundwave and/or Laserbeak is a crime. Ravage would have worked as well. But I am okay with good ol' Skywarp. I always hoped they would characterise him more as a prankster spy. I used to do that for my personal canon so I am glad the card uses artwork of him. Edit the title on the front page… "Tranding"
I love this game wish I had friends to enjoy with. I'll still make decks should the event arise lol. I’m Ken Nagle, Design Lead for Transformers TCG.